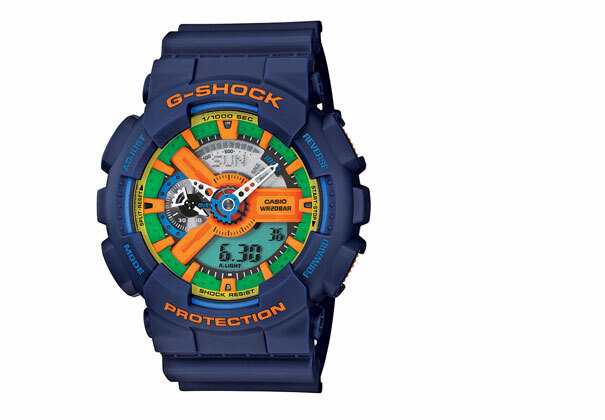 The sun is shining, spring is most definitely here and we are feeling good here at the G-Shock blog. What makes our day even better right now is the arrival of this Spring/Summer GA-110FC Hypercomplex watch in two new contrasting colour ways; red resin strap with a contrasting blue, yellow and orange watch face and a navy with green, orange and yellow watch face. Look at the colours! Look at them! Gorgeous we're sure you'll agree. Living up to their reputation for big case designs, this Ana Digi “three-eyed” phenomenon measures in at a whopping 55 x 51.2 x 16.99mm size with an attention to detail that is second to none - making it second to none! Large anti-skid buttons provide easy embossed indexes, gives a 3-D look and a rivet bezel design adds strength to its overall appearance. What else can we tell you? The Shock Resistant (you know how we do) protects against impact and vibration, while the LED illuminates the face - perfect for those among us that need to know the time whether in the club or diving in deep waters (both are suitable for swimming and snorkelling up to 200 metre/ 20 bar). As well as a standard stopwatch, there's a countdown timer, meaning a stopwatch that counts backwards. Not only that, there's five - five!!! - daily alarms and you can activate hourly time signals. Finally there is of course the World Time - so you know exactly what time it is elsewhere in the world whenever you need to. Or, as you travail the globe, you can switch timezones quite literally at the press of a button. We know, we know, it's a lot. 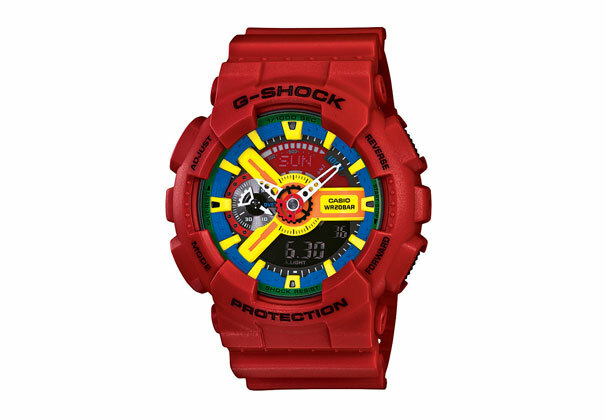 Head over here to pick up yours or get down to G-Shock EAST on Dray Walk, London, to try yours for size.